When taking part in most sports, having good vision will enhance your performance and enjoyment of the activity. For those who need to wear prescription lenses, they may feel nervous wearing their every-day glasses during physical activity, for fear of damaging them or that they may fall off. A great alternative is to use protective eyewear, an option which is increasingly being employed by young and old alike. A fantastic example is Jamie MacDougall (pictured), of Giffnock Soccer Academy under 11’s, who recently started wearing the Leader Sports glasses, which have been fitted with Jamie’s optical prescription. 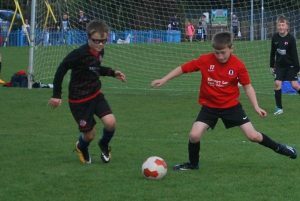 Having the proper visual correction means that Jamie can enjoy the game more and react quicker during games and training, confident in the knowledge that his glasses won’t fall off or be damaged during tackles or even running around.